The desk is finally complete after a long hiatus. The last additions were the pulls, drawer, and pigeon-holes. The majority of what you see here was made from three excellent cherry boards that had almost no waste, and were over 12-inches wide and 10-feet long. As an added benefit they all had excellent figure. Too bad every board we buy can't be as good. The sliders and hidden front apron are made of hard maple for rigidity and easy sliding. The carcase and drop was made of the previously mentioned three cherry boards and the legs are from thicker stock left over from my bed. 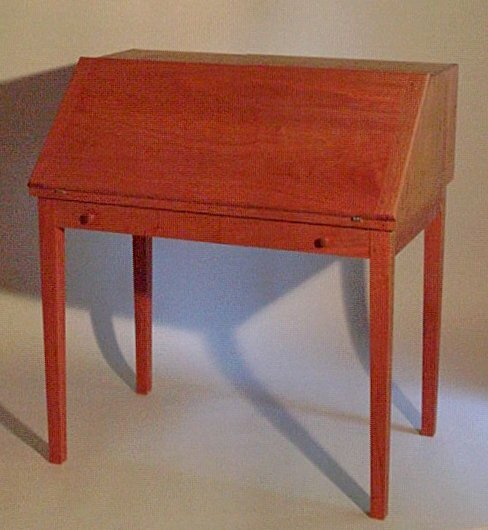 The carcase measures 36 X 24 X 16 inches and the drop front measures about 16-inches deep. The hinges on the drop are supposed to be self-supporting but being an inherently suspicious kinda' guy I provided a slide-out support which is tied together by a false apron. 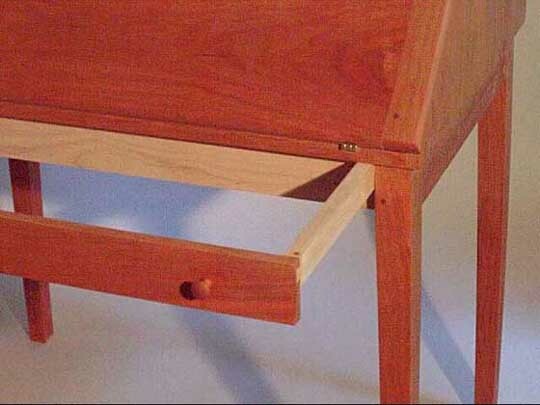 Joinery in the carcase is all by half-blind dovetail joints and the apron-to-leg joints are pegged mortise-and-tenon joints. My furniture design is strictly an ad-lib activity. I think about it and then I build it with no intervening drawings. I am proud to say that some of my furniture has been admired enough for someone else to go through the labor of making drawings so that others might build it. 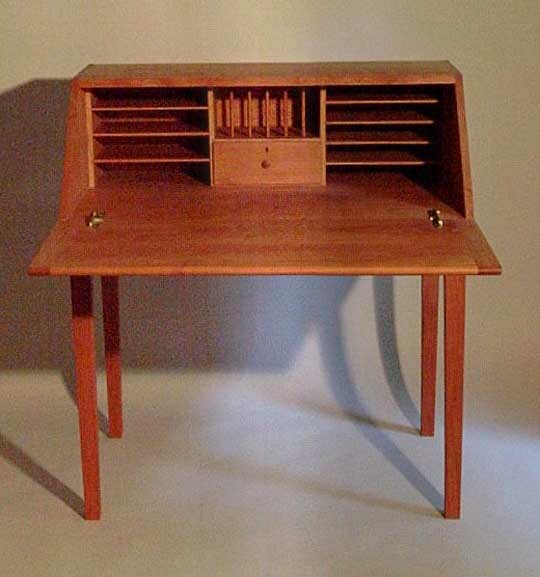 You can find drawings for this desk (and many others) at the excellent site operated by Loren Hutchinson.